Established in 2000 (originally under the name “Mailbarrow”), Access Analytic is a leading consultancy providing AMAZING Power BI and Excel solutions that enable companies to grow faster, reduce costs and reduce risk. Our team of experienced finance professionals have vast expertise in Microsoft Power BI, data analytics, and Excel. We have extensive experience working with finance and operational departments across a range of industries including oil and gas, mining, energy, property, financial services, agribusiness, and manufacturing. 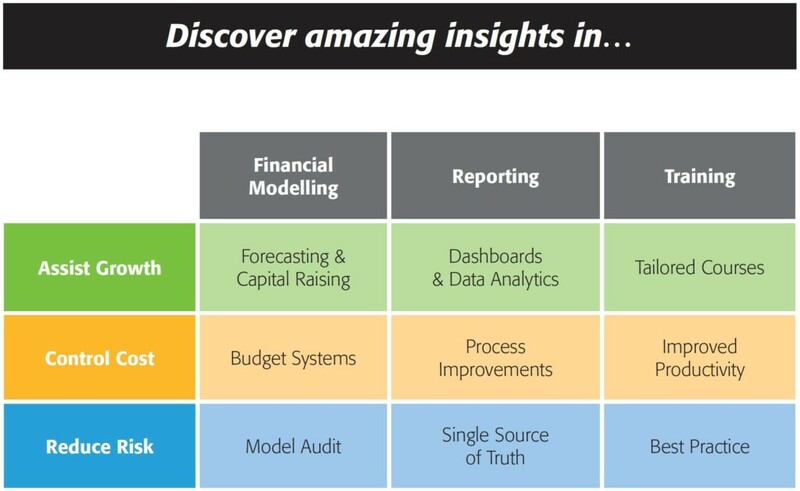 Financial Modelling – development of new models, ‘what-if’ analyses, decision support, financial transaction support/analysis, research, presentation, redevelopment or extension of existing models, and model audit/review. Reporting – data analytics, KPI’s, dashboards, budgets & forecasts, and Board/management reporting. Training – specialised training in the areas of Power BI, financial modelling, budgeting and forecasting, dashboard design, and VBA. Our specialists have years of practical experience in business, accounting and finance qualifications, plus we are Microsoft Certified Excel Experts. This means our specialists can advise on the underlying transaction or project, present and interpret the results from a business perspective, and provide the technical expertise to make it all happen.